Alsace (GB) Your browser does not support any audio element. There are three appellation terms. 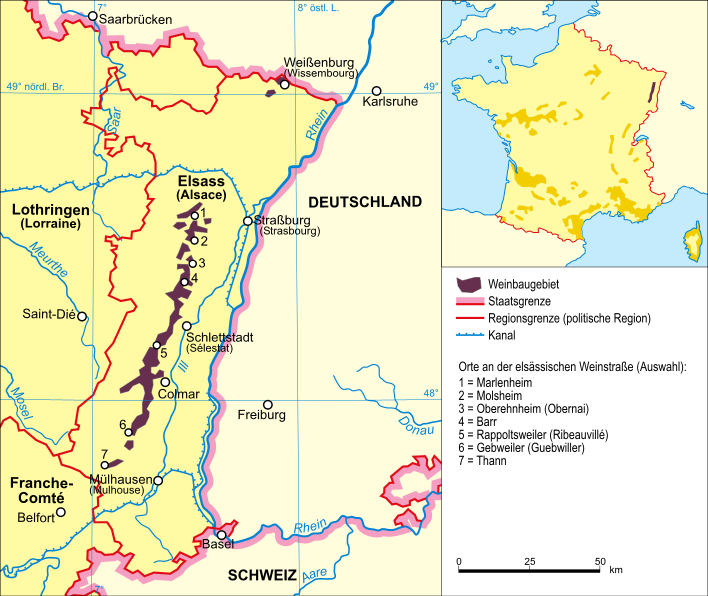 The AOC Alsace accounts for almost 75% of production. Mostly they are varietal wines from 100% of a variety indicated on the label. If this is missing, it concerns a Cuvée different varieties that as Edelzwicker (also Gentil) are marketed. A special position has the Klevener de Heiligenstein from the municipality of Heiligenstein. The AOC Crémant d'Alsace for bottle-fermented sparkling wines accounts for over 20% of production. The AOC Alsace Grand Cru applies to the 51st Grands Crus, Sweet wines have had a very long tradition in Alsace for centuries. The names "Alsace Vendange Tardive" and "Alsace Sélection de Grains Nobles" are added to Alsace or Alsace Grand Cru. It will also Vin de paille ( Strohwein ) and Vin de glace ( Eiswein ) generated. The Alsatian wines are except the Crémant in the slender Flûtes Bottled (flutes). This page was last modified at 14 January 2019 at 13:25.